Born as Francesco Castiglia in Lauropoli, near Cosenza in Calabria, southern Italy on 26 January 1891, Costello arrived in New York in 1895. On 25 April 1908 he was arrested on charges of assault and robbery. On 16 October 1912 he was again in court on the same indictment. Both times he walked free. He became a hired gun for Owney Madden’s gang, The Gophers. On 12 March 1915 he was arrested for possession of a concealed weapon and sentenced to a year inside, of which he served ten months. With his partner Big Bill Dwyer, Costello ran the largest rum running operation in New York in the 1920s but was clever enough to create legitimate businesses, which he used to influence politicians. Costello became the de facto leader of the Tammany Hall political machine in 1928, following the murder of Arnold Rothstein (search the article). Nine years later, he succeeded Lucky Luciano (search the article) as the boss of New York’s biggest Mafia family. 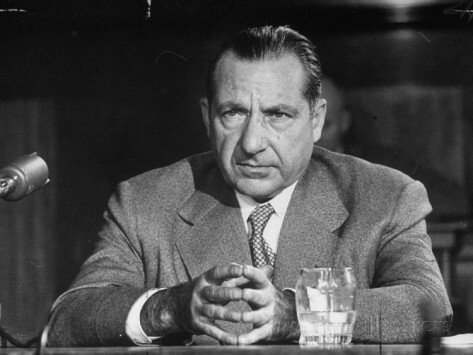 In 1929 he attended the crime bosses’ meeting in Atlantic City and, when bootlegging ceased to be profitable, he moved into gambling with Meyer Lansky and their casinos in Havana, Cuba. Costello was seen as a master criminal who ruled a vast empire and was nicknamed the Prime Minister of the Underworld. Nevertheless, the media could find little evidence to confirm such popular suspicion. On 15 August 1952 he was sent to prison for contempt for refusing to answer a question before the Kefauver Committee investigating crime in interstate commerce. In April 1954 Costello was convicted of income tax evasion and in May 1956 began serving an 11-month prison sentence. On 2 May 1957 Costello survived a gang assassination attempt by Vincent “The Chin” Gigante, inspired by Vito Genovese. As Costello entered his home at 115 Central Park West Gigante shouted, “This is for you, Frank,” before letting off a hail of bullets, one of which grazed Costello’s head. Costello retired following the attempt on his life and Genovese took over control of the family. Costello died of a heart attack in New York on 18 February 1973. Gigante later became head of the Genovese crime family but in 1969 he began feigning insanity to avoid going to prison on racketeering charges. On 7 April 2003 in Federal District Court he pleaded guilty to obstruction of justice, revealing that his “insanity” was a fantasy to delay his racketeering trial. He died on 19 December 2005.